So, have been wondering if your solar panels and solar generator will be affected by the Solar Eclipse? 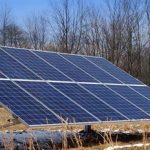 Here’s a short article on how the Solar Eclipse will affect the power grid in areas where we have PV power plants. Not to be alarmed, it shouldn’t be that long. I think most of us will be outside with our protective glasses on trying to watch the solar eclipse anyway. If you own and use the Sol-Ark you will not be affected by the Solar Eclipse because you have battery Back-up. Yay! 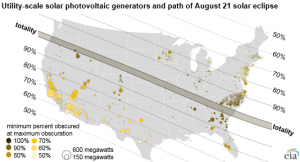 On August 21, a solar eclipse will obscure the sunlight needed to generate electricity at approximately 1,900 utility-scale solar PV power plants in the U.S. However, relatively little solar PV capacity lies in the path of totality—where the sun will be completely obscured by the moon—and the North American Electric Reliability Corporation (NERC) does not anticipate the eclipse will create reliability issues for the bulk power system. Solar Powered generators centered in the path of totality will be affected the most, as the moon will block all direct sunlight for up to three minutes. These generators will also be affected to a lesser extent throughout the entire eclipse event, which will last for up to three hours, measured from the onset to the ending of any blockage of direct sunlight. Generators outside of the path of totality will be less affected, depending on how much sunlight is obscured. The path of totality spans the U.S., starting in Oregon and moving eastward to South Carolina over the course of approximately 90 minutes. The path of totality only affects 17 utility-scale solar PV generators, mostly in eastern Oregon. Hundreds of plants totaling about 4 GW of capacity—mostly in North Carolina and Georgia—will be at least 90 percent obscured. Another 2.2 GW and 3.9 GW of capacity are in areas that will be at least 80 percent and at least 70 percent obscured, respectively.